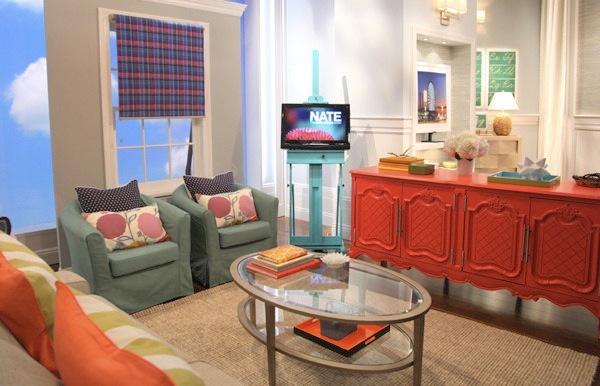 the last makeover i revealed during a segment of the nate berkus show received so many great reviews. i am very thankful to all of you that watch me when i am on. i am appreciative of the support that you give back here on the blog as well as facebook and twitter. 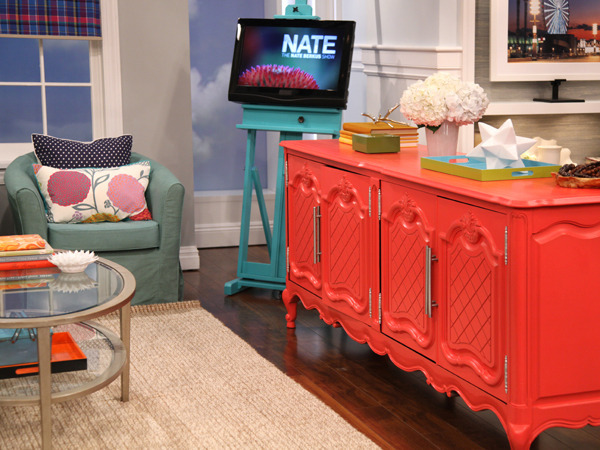 the most talked about element of the last makeover was the credenza. if you watched the field piece here, you will clearly note that she wasnt feeling the credenza at all. mj's response wasnt for the cameras...she really didnt like it. however, as the designer, i had to think about form and function when completing the space. i cant remember exactly how much the sideboard cost (maybe $99?). however, it provided a ton of storage which she needed. when people pop into a thrift or second hand stores they see this. an old, dated, brown piece of furniture. however, when i see something like this i get quite gitty. look at the quality and the craftsmanship. you dont really find solid wood furniture like this much more. i immediately knew a solid color would really enhance all of the details. i picked a few pieces of fabrics seen HERE as inspiration. i knew a wanted a coral color for this piece. however, when they brought me the paint, it was very pink. so i stayed behind after the camera crew left to get the exact color i wanted. i am serious about the work i do. whether it be a $300 room makeover or a $3,000 room makeover, the end result is most important. if you watched the show you will note i stated, "every room needs a hint of black." well that is part of my design philosophy. for this room, the black is only visible when you open the credenza. this will be a treat and a surprise for mj every time she opens it. adding any color to the inside of a piece like this gives the room a bit of unexpectedness. Need a makeover of your own see details below on how you can hire me to help you bring a little life to your space.